Poodleplay Arkestra - Conversations With Ice Cream Men - BFW recordings netlabel - ambient shoegaze indie experimental electronica - music is free! 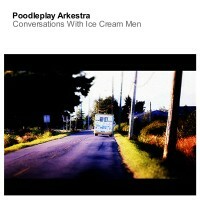 All tracks composed/arranged/produced by Poodleplay Arkestra. The second release on BFW recordings by Manchester's Poodleplay Arkestra is another fantastic EP. And again, hard to define. This is warm ambience - the Jon Hassell/ Brian Eno influence is there, but there is something else that gives this EP a unique character. Get it downloaded!